The electromagnetic and optical nonlinear effects provide an important platform in a broad spectrum of technologies including high harmonic generation, sum and difference frequency conversions, self-focusing, optical solitons, and multi-photon absorption. When illuminated by high light intensity, the material properties are modified depending on the applied electromagnetic field amplitudes, and the nonlinear process is greatly enhanced during the interaction between light and materials, giving rise to spectral components at new frequencies. Although tremendous advances for nonlinear manipulations have been achieved in recent years, the overall efficiency of the frequency conversion still remains very low. Metamaterials, which are usually constituted by spatially distributed periodic or non-periodic array of subwavelength resonators, have been demonstrated as a powerful tool to alter the responses of incident electromagnetic waves. By optimizing the element geometries and their spatial alignments, the metamaterials are easy to create highly customizable properties that can be exploited in a wide variety of applications like super-resolution imaging, optical cloaking, and novel antennas. The nonlinear characteristics of metamaterials have displayed emerging potentials for frequency conversions owing to the induced local fields around the resonators. However, the conversion ratio is not satisfactory especially under the excitation of small signals. 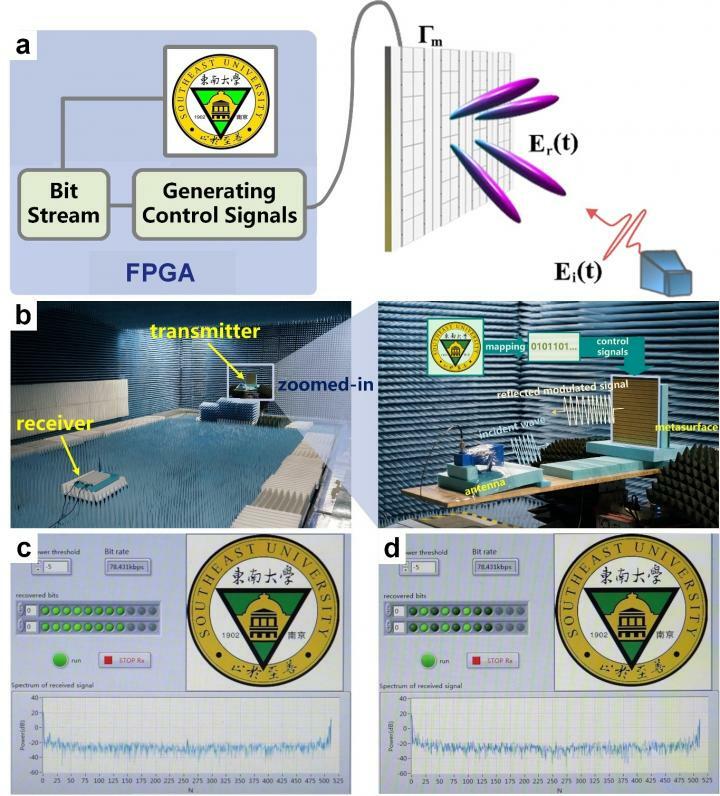 In a new paper published in the Beijing-based National Science Review, scientists at the State Key Laboratory of Millimeter Waves in Nanjing, China, the National Mobil Communication Research Laboratory in Nanjing, China, and the Photonics Initiative, Advanced Science Research Center in New York, US, present the latest advances in the nonlinear harmonic manipulation with a programmable time-domain digital coding metasurface. They find that the metasurface with time varying reflectivity can respond to the excitation carrier nonlinearly in a strong way, with the harmonic intensity dependent on the digital coding sequence of the reflection amplitude and phase. These scientists summarize the details of the theory and design method of the metasurface, and the future application of this technology. The metasurface is composed of periodic coding elements loaded with varactor diodes. “Driven by different combinations of output voltages from a field programmable gate array (FPGA), our metasurface can implement many functions by controlling the time-domain digital coding states,” they state. “As an example of applications, we explore the implementation of a new binary frequency-shift keying (BFSK) wireless communication system, which highly simplifies the classical heterodyne architectures for wireless network systems. In the proposed BFSK system, the two basic carrier frequencies are synthesized directly via the metasurface, without using complicated analog-digital converter and microwave filters, mixers, and amplifiers, showing great advantages in terms of simplicity and efficiency,” they add. “The proposed concept and method pave a way for simplified and compact communication and radar systems for a wide frequency range, from acoustic to microwaves and optics,” the scientists forecast. The calculated spectral intensities of the output harmonics under different PM modulations. (a-b), 1-bit PM coding 01010101… with the length of the coding sequence M=2 and the reflection period T=1μs. (c-d), 2-bit PM coding 00-01-00-01-… with M=2 and T=1μs. (e-f), 2-bit PM coding 00-01-10-11-… with M=4 and T=2μs. g-h, 2-bit PM coding 11-10-01-00-… with M=4 and T=2μs. This research received funding from the National Key Research and Development Program of China, the National Natural Science Foundation of China, and the 111 project. The National Science Review is the first comprehensive scholarly journal released in English in China that is aimed at linking the country’s rapidly advancing community of scientists with the global frontiers of science and technology. The journal also aims to shine a worldwide spotlight on scientific research advances across China.